Greetings! I’m finding myself quite recovered from the Thanksgiving holiday and am gearing up for the Christmas season. As I mentioned our lives have been quite full lately and a big chunk of my time has recently been taken up by church. I’m not here to prattle on about religion. I promise. But church is a part of my life again. Partly because the political climate makes me nervous, partly because I have two little girls and want to give them a solid religious base, and partly because I was really missing the community church brings into one’s life. For most of October and November I’ve spent Sundays going from service, to sunday school, to grocery shopping, then back to church for New Members Class. It was exhausting, but also fulfilling and I’ve met some pretty nice and welcoming people. I had planned to make a new dress for the service when new members are introduced. The dress is even mostly put together, but well…it wasn’t quite right. 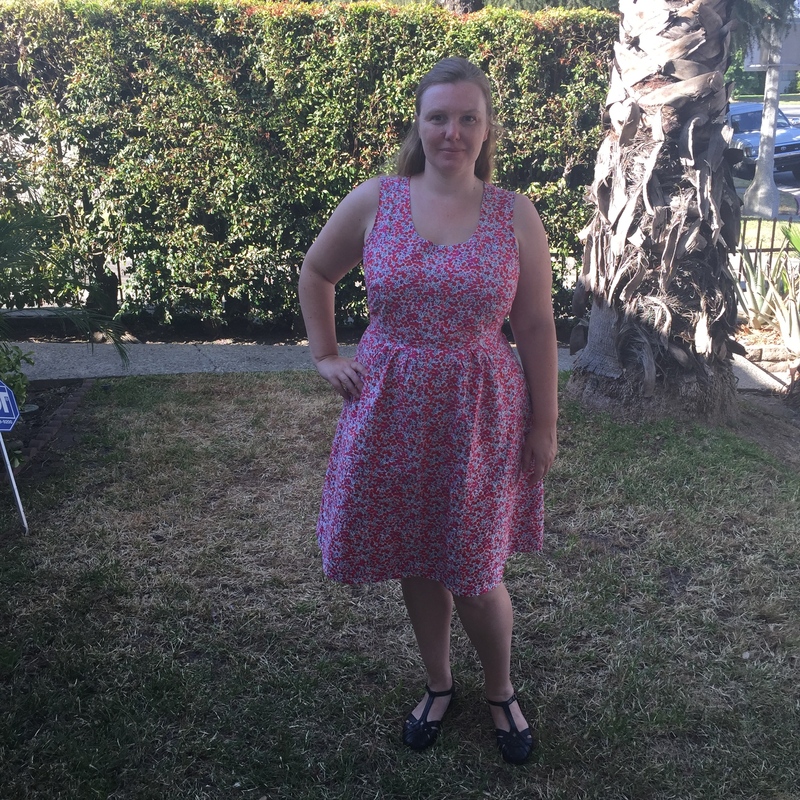 I used rayon challis and it will be a lovely spring dress (maybe Easter? ), but it wasn’t right for November. Plus I need to take out a huge chunk of length from the back and that means a lot of seam ripping. I just did not have the time for such an endeavor. 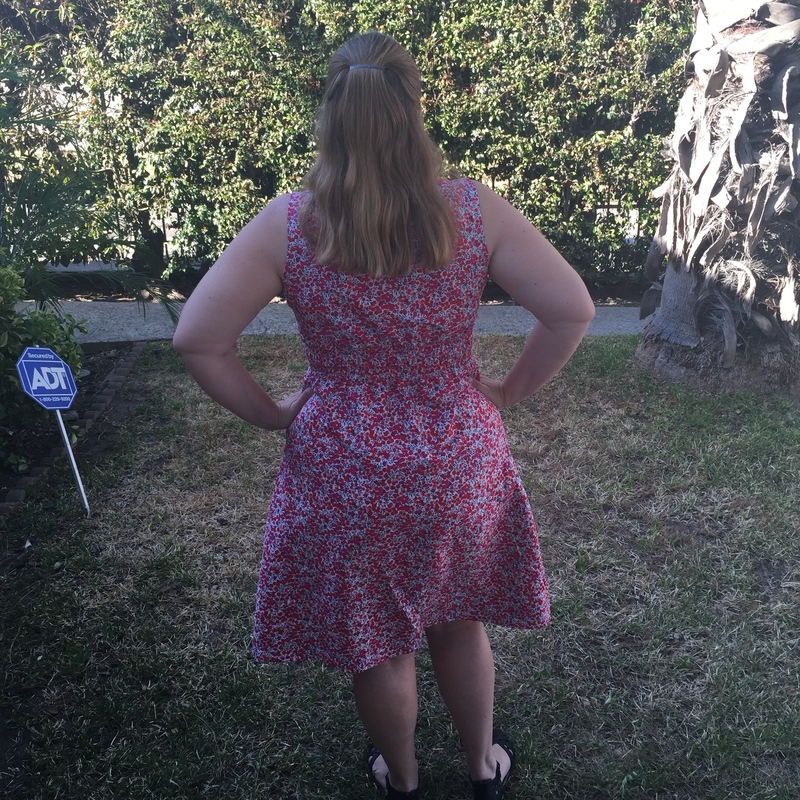 So I set aside the rayon dress in favor of something quick and easy, a tried and true pattern. Yep, my favorite winter dress, the Cashmerette Washington bodice with a half circle skirt. I’ve made it several times and knew I could whip one up in just a couple hours. Tada! A nice fresh dress to kick off the winter sewing season. Soft and lovely and forgiving to wear. I don’t really have new to add to my thoughts on the pattern. I’ve used it several times and it always works well. This time I added a touch of ruching at the bust. The fabric is Liberty of London Ganton Jersey in the pattern Meandering Chrysanthemum. I purchased it at The Fabric Store in LA a few month ago for what must have been a clearance price. Something like $16/yard when Liberty jersey tends to go for double the price. Usually I like a bit of lycra in my jersey, but this 100% cotton version was too nice to pass up. It reminded me of the fabric I used for my very favorite winter dress. In practice it was hard to find the grain of this jersey and I am wondering if there was a reason it was so cheap. Anyways, this dress was originally intended for Thanksgiving. I figured it would look nice for photos and also be comfortable for the 5 hour drive to Vegas and eating massive amounts of food. I was right on both accounts. I give the dress two thumbs up. It also had me feeling confident while standing in front of hundreds of people in church. Now to sew up the two more dress quantities of fabric I ordered this month. Once I pulled out my winter dresses I realized I have about 5 days worth of work clothes. Not quite as much as I’d like. Plus some of the things I packed away looks a little worse for wear after spending the summer in a plastic bin. And if you’re interested in other sewer’s favorite patterns, I hope you’ll check out the Sewcialist’s Tried and True Month. It is really interesting to see what styles people pick to make again and again. For me, this skater dress style is now a staple of my winter wardrobe. Easy to make and easy to wear. After feeling frustrated by my recent attempts at making woven dresses, I took a step back. What pattern has fit me the best? Could I work with it? 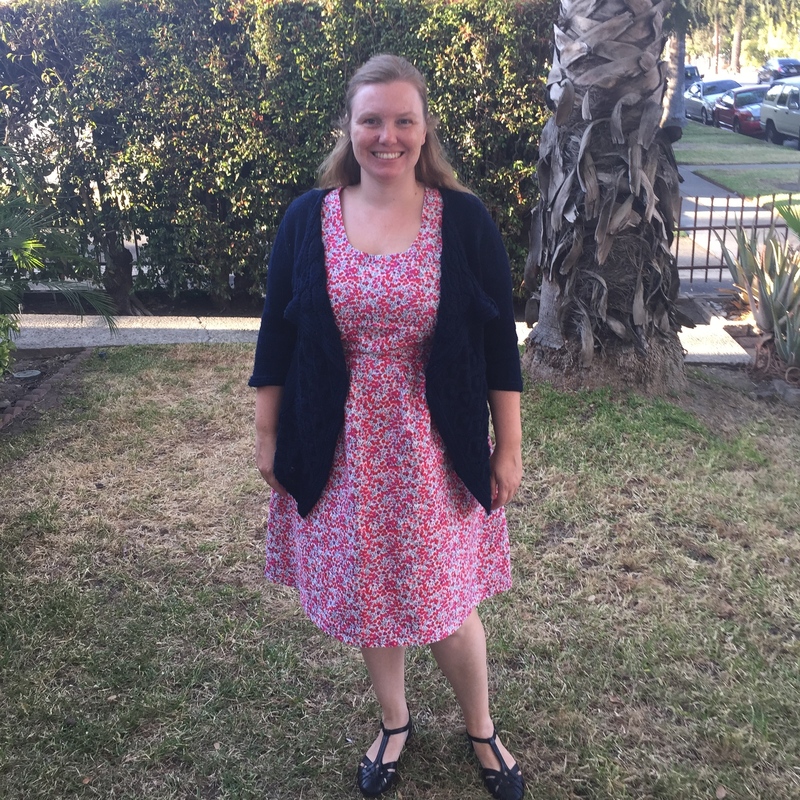 Well I thought on it for a while and determined the Gertie dress I made a few months back is still my favorite. Light as air to wear and with a good fit. It only needed a few tweaks. So I’m saying goodbye to the Upton pattern for now. Maybe, just maybe I need to stick with misses patterns and grade out rather than starting with plus patterns. Worth trying! So I put on my Gertie dress to access the fit. Lots of little tweaks, but nothing huge. Looks like a lot, but most of these were easy to accomplish when re-tracing the pattern. Then I conquered an adjustment I’d been mulling over for a while. A narrow back adjustment as outlined in this Threads Magazine article. Now, one would normally use something like muslin fabric or something purchased cheaply, but I’m running low on wadder fabric. I used my Liberty! It worked! Well, not quite! The finished dress is beautiful, but it turned out I’d over done lowering the bust darts! I had to rip it all apart to redo them. In the end that worked out well because now I have custom fit darts. I’m thinking I might take that approach more often. These are some of my most successful darts and it wouldn’t be terrible hard to do. I could just sew the top and bottom of the side seam then try on my dress and pinch out the darts as I wanted them. This was supposed to be a muslin to test my newly re-drafted bodice, but then when the darts were all wrong I couldn’t bear to fix the darts and then rip this all apart to trace off the pieces. I guess that’s what happens when one decides to test new ideas with Liberty of London lawn. This stuff is too expensive and dear to rip apart, but I love all my stash fabrics too much to make a wadder. I ended up picking this yardage piece because it had been sitting unloved for too long. It was only 2 yards of Penrose Rose (color D) I purchase on an Massdrop a while back. Part of me wanted to see if I could get a whole dress out of such a small piece and I’m thrilled that I could! One of the other issues I encountered was a lack of lining fabric in my stash. I seriously need to pick up some nice lawn to have on hand! I dug around a found a few scraps of ivory lawn left over from my 1912 dress. It wasn’t enough to make the all in one facing I’d planned. It wasn’t even enough for bias tape! But the awkwardly shaped scraps were just enough to make some very narrow facings. These worked perfectly and do not flip out the way full sized facing usually do. The other issue I encountered was when I finished the dress it looked too plain. It was just a simple thing with a whole lot of patterned fabric. I dug around through my lace scraps and found a length of antique cotton lace that was leftover from a 1930s dress I made years ago. It definitely made this dress look less homemade. Lastly for the skirt I took the leftover yardage after cutting out the bodice pieces and determined I could just eek out a skirt that came to the top of my knees while still being able to line up the subtle striping pattern at the side seams. it also means the skirt is a full 100 inches wide! So wide! To keep the width from becoming overwhelming without a petticoat I pleated the fabric using my own fingertip as a guide on how large to make each pleat. I’d thought about making a less wide skirt, but I didn’t want to have an awkward piece of fabric leftover. In retrospect I could have used the leftovers to make bias tape, but now that the dress is done I am so glad I went for the super pleated skirt. Since I finally have a dress I love I’m trying to decide what to make next. I wanted to make a shirt dress this summer, so maybe that should be next. While I ponder I have a couple quick knit things to make. What do you all think I should tackle next?